Now that the Eurostar has put so many French towns and cities within reach of the UK, the big decision is where to go. 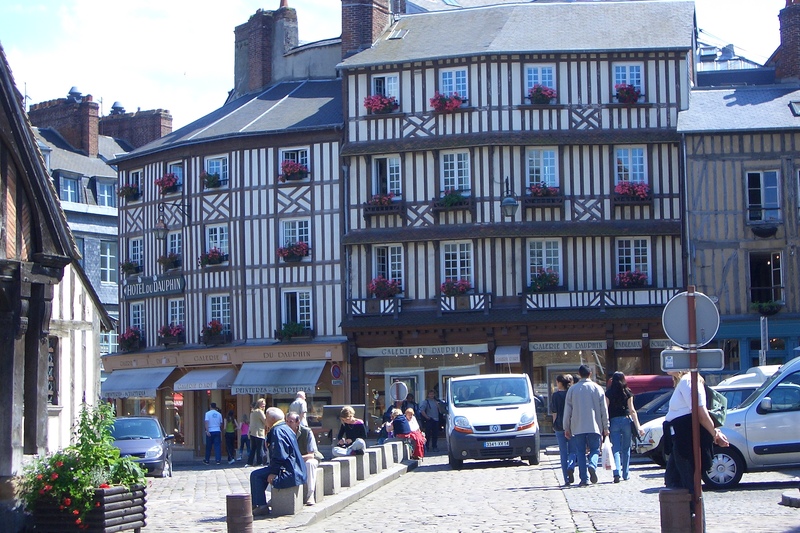 Yes, Paris is wonderful, but there are many other lovely places within a few hours of London, or just a hop across the channel from Dover or Portsmouth, and one of the loveliest is Honfleur. 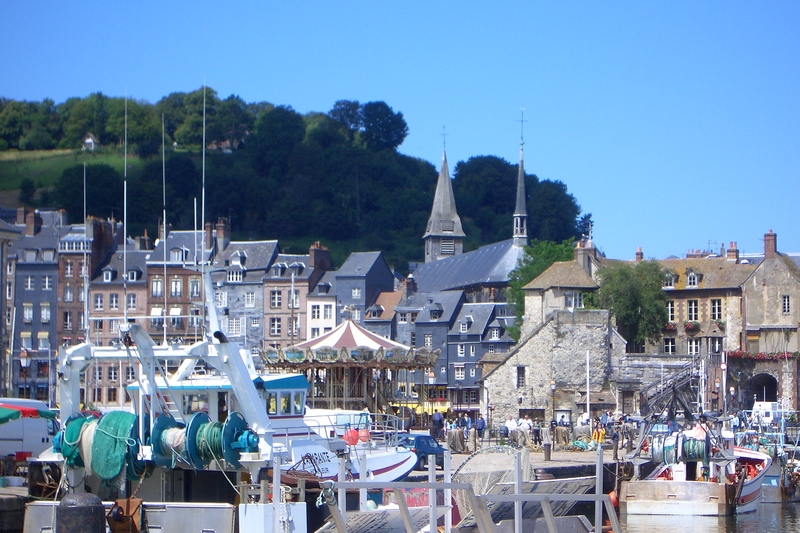 Of all Normandy’s coastal resorts, Honfleur is the prettiest – it is like a postcard come to life – with its yacht-filled harbour lined with cafes. Most people will be familiar with the look of the town from the dozens of Impressionist paintings in which it features, from local-born painter Eugène Boudin to Pissarro, Cézanne, Renoir and Monet, who followed Renoir from Paris to paint the ever-changing light. 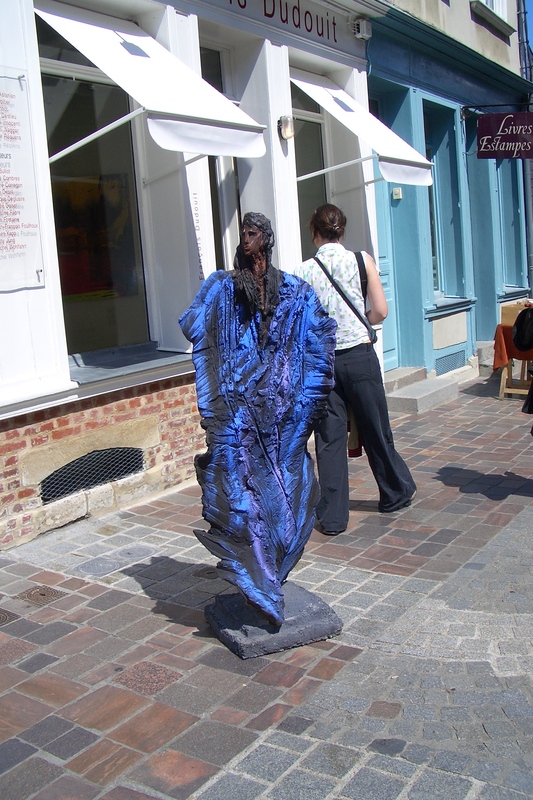 Today the town still acts as a magnet for artists and there are probably more galleries than cafes or restaurants, and more bad art per square metre than anywhere else in France! Of course there is good art too, and you may pick up a bargain, but you will have to fight off the new rich oligarchs who now make up most of the tourists. Its exceptional geographical position makes Honfleur an ideal base to discover the route du cidre or the route des fromages, for walks around the Seine estuary in the steps of the impressionists, for visits to the bustling resort of Trouville, to historic Rouen, and to the Pay d’Auge valley for some of Normandy’s best cider and cheeses. Its harbour invites one to sit and relax over a coffee and cognac, lunch like the locals on the local moules, and watch the manoeuvering of boats in the harbour while the sun goes down. Normandy’s fertile countryside supports a rich dairy industry and prolific apple orchards, the basis for its cuisine based on the three Cs – cream, cider and cheese. And from the cream of course, comes the famously rich Normandy butter and from the apples comes the famous Calvados. 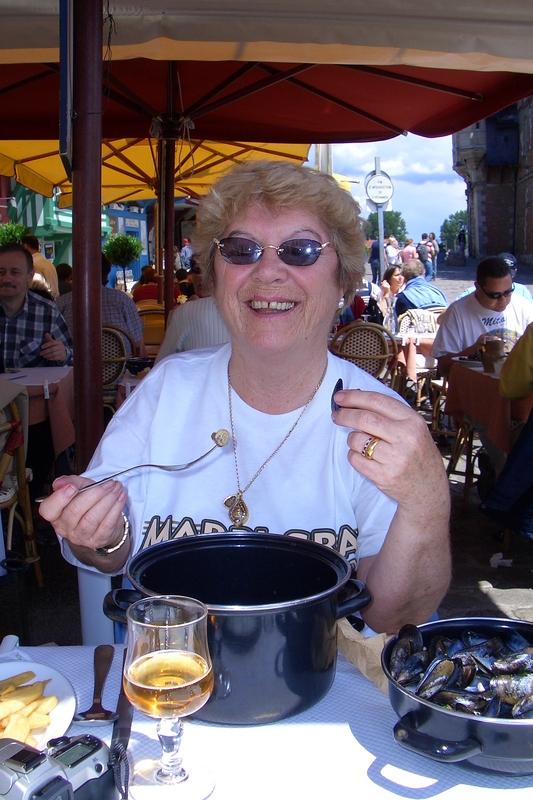 There are beaches to die for in Normandy, as indeed some did in the Second World War, and visits to the famous battlefields can be easily arranged. There is a small beach in Honfleur but it would not suffice as a ‘holiday beach’, but is adequate for a day’s sunbathing. A few things not to miss. The Vieux-Bassin, (old dock) in the heart of the town, and the high, narrow old houses which overlook the harbour on three sides. 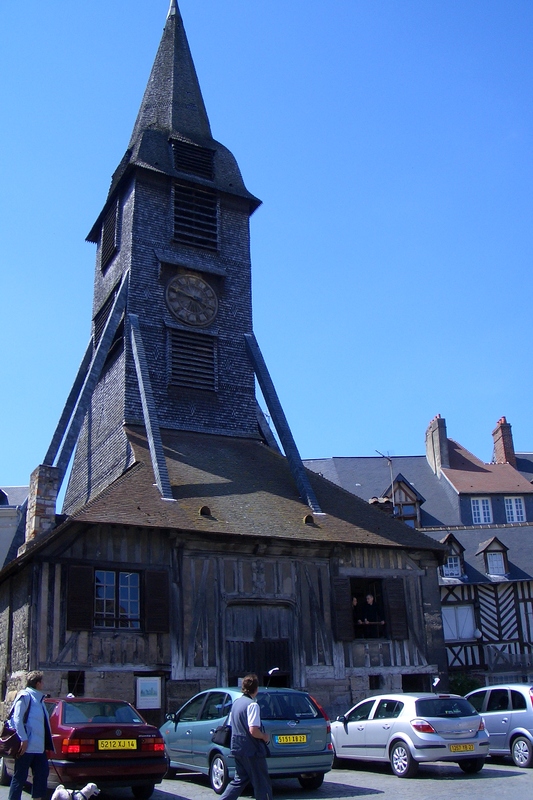 Saint Catherine’s Church built entirely of wood. The Notre-Dame-de-Grâce Chapel has relics of the first explorations that marked the beginning of the first colonisations in New France (Canada). One of the oldest sanctuaries in the area still stands on the plateau de Grâce, surrounded by ancient trees. 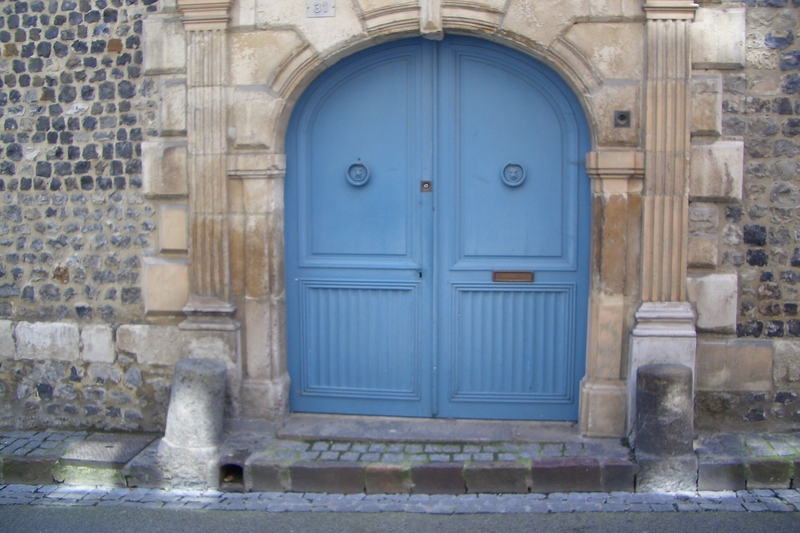 The Eugène Boudin Museum houses paintings by the 19th and 20th century painters from Honfleur and around, who followed Boudin – Dubourg, Jongkind, Monet, Courbet, Dufy, and others. Also on display are drawings and paintings bequeathed to the town by Eugène Boudin. Les Maisons Satie Museum paying tribute to Erik Satie, musician and composer born here in 1866. The Greniers à sel (Salt granaries): these date from 1670 and were used for storing up to 10,000 tons of salt at a time. Today these vast stone buildings are used for exhibitions, concerts and conferences. 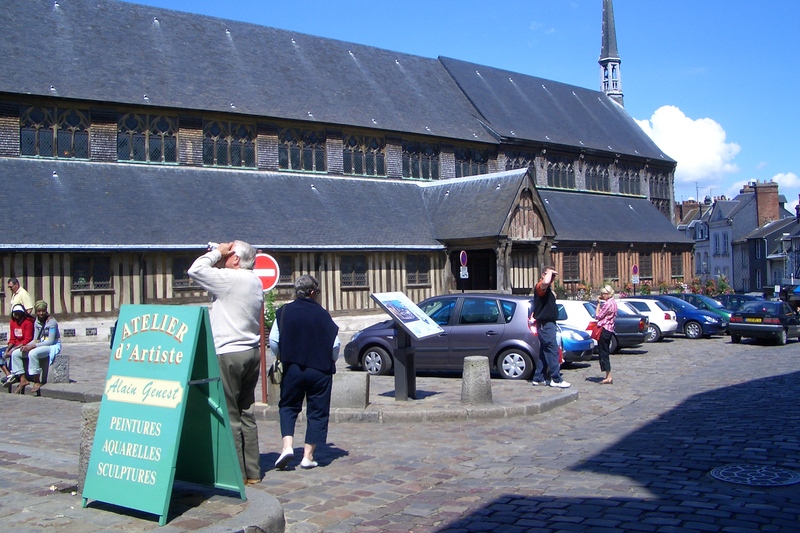 And find time to take a trip around the estuary, stroll along the backstreets where you will come across little museums, odd statues and traditional markets and discover the spirit of old Honfleur. Thanks for liking my blog and hope you can visit it one day. Or maybe you already know it better than I do! Stunning photos, Mari. This morning I have been cruising along a French canal, escaping the midday sun in a wine cellar and now soaking up the pleasures of Honfleur. This is arm chair travel at its best. Thanks, Jan. Maybe we’ll visit it together one day? Would be nice.